Windows Media Player plays media. The term media on computers refers to something other than text: Audio and video are examples of media. Audio is a catchall term for music and other sound files, such as books on CD. You can buy music online and download the tracks directly to your computer. Click its icon (a white triangle on an orange circle on a blue square) in the taskbar. 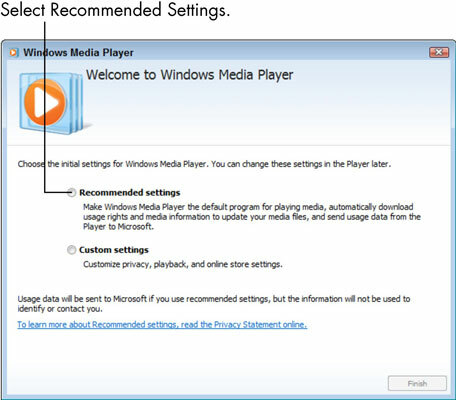 The first time you start Media Player, the initial settings screen appears. Click Recommended Settings and Finish. 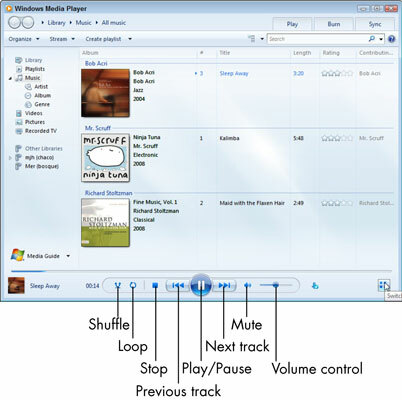 After a brief delay, the Media Player Library displays music that comes with Windows 7 and any music already copied to your computer. Click Play to play the music. You can adjust the volume with the slider. Mute and unmute the music with the Mute/Unmute button. Pause the music and resume playing. Stop the music. Play any music. You can turn on shuffle, which randomly mixes the tracks you play. Click the Loop button to turn on repeat, which continuously plays all the tracks again after all have played. The Previous button skips to the previous track, while the Next button skips to the next track. Click the Now Playing button to reduce the player to a small size. 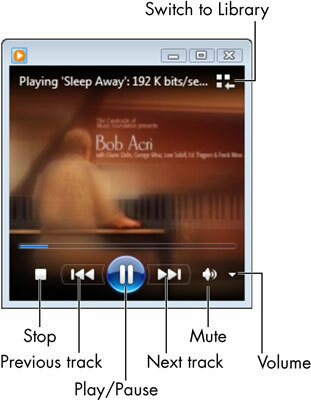 Click the Switch to Now Playing button to the right of the toolbar to shrink Media Player to a smaller window. To return to the larger window, click the Switch to Library button.